The National reviews The Arts Center’s first concert in the Inaugural Season. 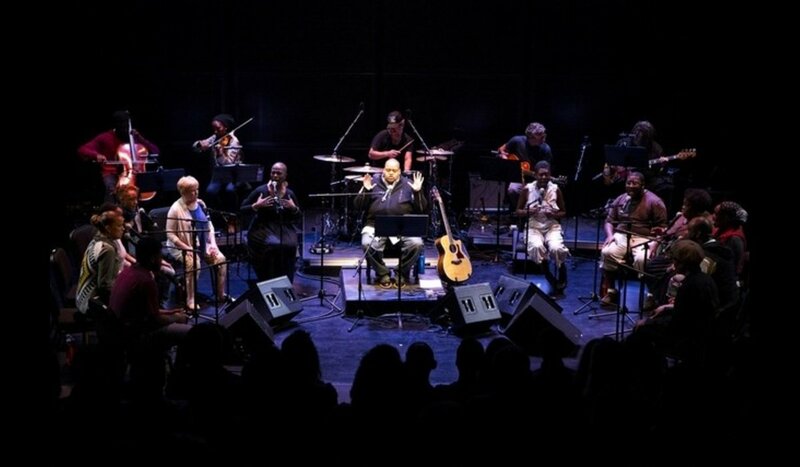 Toshi Reagon describes her concert setting of Octavia E Butler’s Parable of the Sower as a work in progress and hopes to turn it into a full opera. But it is difficult to imagine a performance that could be more filmic, visceral or dramatic than the current production’s UAE debut, which was so eloquently created by Reagon’s musician-players at New York University Abu Dhabi’s Saadiyat Island campus on Wednesday. Reagon’s work is a musical adaptation of a post-apocalyptic science-fiction novel that follows the fortunes of a young, black woman, Lauren Olamina, who lives in a southern California of the near future beset by water shortages, environmental catastrophe, danger and widespread violence. In building her new life, Olamina not only gathers a family for herself but also creates a new community and a religion in the process. Despite the obscure-sounding source material, the performance sold out in 15 minutes — and by the time Reagon’s ensemble started to file into the 150-seat Black Box Theatre the anticipation was palpable. Reagon introduced her version of Parable of the Sower with an explanation that resonated with many of the expatriate members of the audience. This was a story, the composer explained, about “having to create positivity in a place where you did not expect to be with people you did not expect to be with” and while it would not slavishly follow the plot of the novel, it would, she hoped, create a “big musical arc”. The songs that followed not only traced a story that became clear even to the members of the audience who weren’t familiar with Butler’s tale, but did so in a way that painted vivid and at times harrowing mental pictures of the character’s experiences. A product not just of Reagon’s three-decade long career but also that of her mother, Bernice Johnson Reagon, who co-wrote the opera’s music and lyrics, the results amounted to something more than an opera. Here was a history and possible future of the African-American experience in North America explained through 23 tunes that charted the development of music from 19th century spirituals to gospel, rhythm and blues, soul, folk, rock, funk and punk. At one moment the audience found themselves working and singing, like slaves, in parched fields while at others they rejoiced like gospel singers in a church and by the end of the night everybody was on their feet, elated in a standing ovation.